Body language is a non-verbal way of communication, where in we reveal our intentions through body postures, gestures, eye movement and facial expressions. Whether we are feeling happy or sad, amused or anxious, can all be understood through our body language. Such a non-verbal communication can not only help build relations during social interactions, but can also be a subject of misunderstanding if it is wrongly interpreted. Since there is no exact science to this it may vary from person to person. However, here are some simple lessons in body language that can help you communicate better. It is applicable to both adults and kids. Crossing arms: Whilst talking to somebody if you notice them crossing their arms, it indicates that they are not comfortable divulging certain information to you. Even in a classroom, if a student sits with his legs or arms crossed, that marks an indication that he is not interested in the lecture and that he is not open to receiving information that is being given. The partial arm cross: A partial arm cross is one in which one arm touches the other arm across the body at the elbow. If you are new to a group or a meeting, this type of cross would indicate low self-confidence. Arms behind the back: Standing with arms behind the back in a cross is a sign of respect and sincerity. It is often seen among students, senior military personnel and others in a disciplinary position.However, an upper grip of the arm (wrist and above) indicates frustration and a feeling of self control. Clenched hands: Clenched hands in the raised, middle or upper position, indicates a negative thought. A person in such a position is hostile and will need persuasion to change his attitude. Handshakes: Your handshakes tell a lot about you. If a person shakes his hand loosely with you that marks disinterest whereas a very warm handshake would mean that the other person is indeed very thrilled and excited to meet you. Shoulders bent while sitting: Kids often sit like this, in the park on a bench or in front of the television set watching their favourite cartoon show. This posture indicates poor self image and encourages negative thoughts. An upright and straight posture will help them grow into more confident individuals. 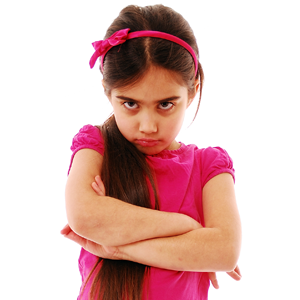 Hands rested on the waist with legs apart: This indicates an aggressive mood and is often seen in kids when their parents don’t comply with their wants. Crossing legs while sitting: We often sit like this. But what does it indicate to the person sitting next to us. Sitting with crossed legs indicates a want for privacy. It is a rather un-welcoming gesture. Tight-lipped smile: This indicates secrecy and mischief. So if your son says he hasn’t broken your vase with this smile, you know the truth! Bottom lip jutted out: This indicates a feeling of sadness and is often used by kids in order to seek sympathy. So beware. However sometimes they may be on the verge of crying. Left and right eye movement: Generally, if a person looks to the right while talking, it indicates that the person is creating or fabricating something. In general context it could indicate lying but in some other instances like storytelling to a child, it would be normal. If a person looks to the left while talking, it indicates remembering and recalling facts from memory. Direct Eye contact: This indicates confidence and assertiveness in the person. Blinking frequently, widening eyes and raised eyebrows: All these three indicate excitement, interest and pleasure in a person. You must be familiar with the widening of eyes look that your kids give at the sight of an ice-cream scoop or a chocolate pastry. Body language is an art that can never be completely mastered for the purpose of masking, but learning what different postures tell us, about our state of mind, is indeed very interesting.